This is a low-priced task chair that you can easily afford for every room in your house. 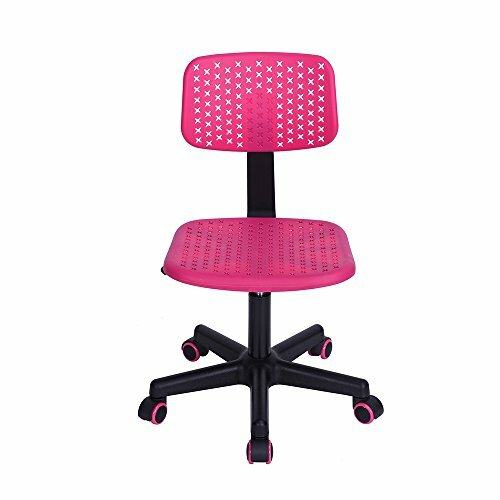 It's perfect for the kids and their homework desks but it's also a great chair for a lady's or little girl's bedroom or bathroom for sitting at a vanity and putting on makeup. And, if you just need some extra chairs for seating around your home or ofﬁce, this one is perfect for that, too. It's fully adjustable and has a plastic seat, back, base, and casters which coming altogether to bring you the most comfortable experience. * Materials:polypropylene (PP) plastic and nylon plastic. * Size:40.5 x 37 x 75-87 cm, seat H 35-47 cm, base leg L 25 cm, more details please check the picture.